Blasted in the media and online for dangerous, low-hanging jumbles of wires hanging from its utility poles, the Provincial Electricity Authority blamed shoddy work by technicians from cable-television and Internet suppliers for the problem. 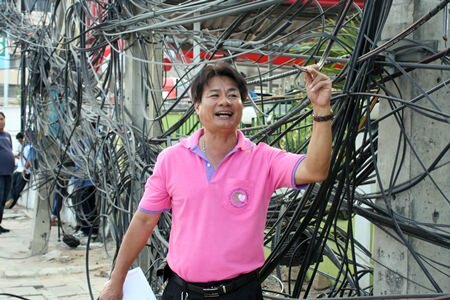 PEA technical officer Panya Boonsamer May 12 said every company other than the PEA is responsible for adding to the cable problem so evident throughout Pattaya, especially along Sukhumvit Road. 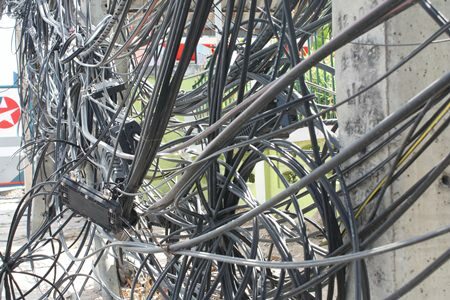 PEA technical officer Panya Boonsamer says that shoddy work by technicians from cable-television and Internet suppliers is to blame for the tangled mess of wires seen around town. He explained that when a customer signs up for a new or different cable-TV, Internet or telephone service, technicians from those providers string a new live wire. At the same time, they’re supposed to remove the old, dead cable from the power poles, on which companies rent space. In reality, however, few technicians bother to remove the old cable, even when they see the weight of the existing lines has caused the entire bundle to sag. Panya said PEA has contacted all the companies renting space on its pole to address the problem and remove dead lines. However, he acknowledged the process may take time as all the work requests must make their way through corporate bureaucracies and be approved by head offices in Bangkok.